Reduced dependence on the medical system. Pulmonary Function Testing (PFT) is a complete evaluation of the respiratory system including patient history, physical examinations, chest x-ray examinations, arterial blood gas analysis, and tests of pulmonary function. The primary purpose of pulmonary function testing is to identify the severity of pulmonary impairment. These are a group of tests to measure how well the lungs function. The tests are done and results would be given in the same session. Pulmonary function tests are tests performed to make measurements of how your lungs and airways function. - PFT is also called Pulmonary function test. 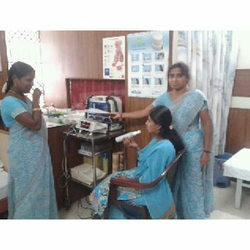 - User friendly equipment with facility for computer generated report. - Recommended for asthmatic and COPD patients. - Pre & Post medication comparison available. Pulmonary function tests are a group of tests that measure how well the lungs take in and exhale air and how efficiently they transfer oxygen into the blood. Pulmonary function tests are confusing to many patients. But, as those with heart disease are usually aware of their blood pressure and cholesterol levels, the importance of knowing your numbers as they apply to pulmonary function tests (PFTs) and COPD is commonly overlooked. The pulmonology department offers state-of-the-art facilities such as PFT lab which benefits the patients with cost-effective, accurate and rapid test results.